19th-century London. 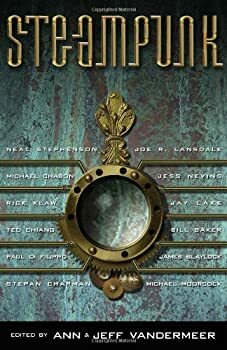 A quiet evening among more or less renowned gentleman, including the gifted scientist-explorer Langdon St. Ives, at their favorite tavern is interrupted by word that a map to a missing mysterious device has been found. In no time, as chronicled by St. Ives’s cohort Jack Owlesby, the group sets off to claim the map and device, racing against the shadowy figure of St. Ives’s nemesis, Ignacio Narbondo (now known as Dr. Frosticos). The first new tale of St. Ives in nearly two decades, The Ebb Tide is a brisk steampunk yarn with a dash of Sherlock Holmes. (Steampunk is, of course, a play on cyberpunk; instead of computers, the focus is usually on airships or mechanical men.) The focus in The Ebb Tide is on underwater transports (and a strange underwater environment), which James Blaylock, as usual, describes with clear prose that manages to evoke the derring-do of the age. It’s an engaging enough tale, and the illustrations by J.K. Potter are excellent. However, with a modest 110 pages of text (in my advance copy), there’s just not much meat to it. There’s virtually no character development, and I don’t believe Dr. Frosticos even has any dialogue. Sub Pressis offering a deluxe hardcover edition for $35 (or $23 on Amazon as of October 2, 2009); however, many fans of steampunk would be better served by purchasing the Steampunk anthology (edited by Ann and Jeff VanderMeer) for about $10, as the latter includes the more satisfying St. Ives tale “Lord Kelvin’s Machine” (one of the best tales in the anthology), as well as many other good stories. 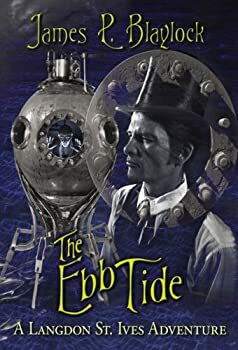 Thus, The Ebb Tide is recommended as a purchase for die-hard steampunk aficionados, or as a library loan for casual steampunk fans. 3 small brass portholes.